Here is the full text of my 31st Quartz column, ”America’s huge mistake on monetary policy: How negative interest rates could have stopped the Great Recession in its tracks,” now brought home to supplysideliberal.com. It was first published on September 6, 2013. Links to all my other columns can be found here. © September 6, 2013: Miles Kimball, as first published on Quartz. Used by permission according to a temporary nonexclusive license expiring June 30, 2014. All rights reserved. There’s a reason why the workings of the price system through supply and demand are taught as one of the first lessons when studying economics. This is where the action is. When people want to buy more of something than others want to sell, the price of that good goes up, signaling that more needs to be produced and less needs to be bought. When the opposite occurs (there’s more to sell than people want to buy), the price of that good goes down to signal that less needs to be produced and more needs to be bought to bring things into balance. Interference with those price signals lowers the IQ of the “invisible hand,” this competition that naturally guides markets. One key set of prices in the economy are interest rates—which, after accounting for inflation, tell how much more one has to pay to buy something now instead of later. Interest rates are crucial in balancing the total amount of goods and services households and firms want to buy and use now with the total amount of goods and services they want to produce and sell now. Indeed, if anything prevents interest rates from adjusting appropriately to balance aggregate supply and demand, bad things happen: if interest rates are too low, the imbalance will cause the economy to overheat and generate inflation; if interest rates are too high, the imbalance will cause the economy to fall into a recession. Conversely, when interest rates do adjust appropriately, anytime the economy starts to overheat, interest rates go up to balance aggregate supply and demand and stop the overheating in its tracks; anytime the economy starts to fall into a recession, interest rates go down to balance aggregate supply and demand and stop the recession in its tracks. The paper Robert Hall presented at last month’s Jackson Hole conference (pdf) on monetary policy has a good statement of this widely-held view that the zero lower bound has been a major factor in the miserable course of economic events in the last few years (pdf). 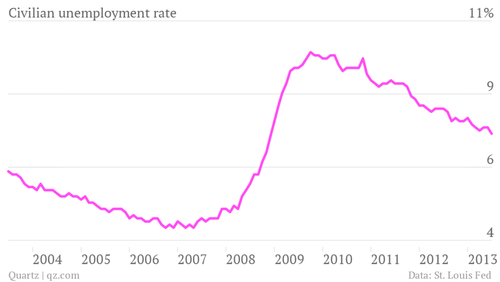 The simple truth is that the Great Recession was very painful and US unemployment is still painfully high five years later, primarily because of the zero lower bound. Even without the ZLB, there would have been some hit from the financial crisis that ensued with the bankruptcy of Lehman Brothers on Sept. 15, 2008, but negative interest rates in the neighborhood of 4% below zero would have brought robust recovery by the end of 2009. The reason negative interest rates are needed during a serious recession (at least for countries that have low rates of inflation) is that businesses are scared to invest, banks are scared to make loans, and even better-off households are scared to spend when times are bad. If it is easy to sit on cash, then frightened businesses, banks and households that have a cash cushion will sit on cash. If businesses aren’t spending to build factories, buy machines, or do R&D, and households aren’t spending on things to make their lives better, everyone who is trying to produce and sell something is left in the lurch. Negative interest rates for idle cash would motivate those who would otherwise sit on that cash to take the risks to put it to use to build the economy. Those who needed safety the most could still get that safety, if they are willing to pay for it. But those willing to take risks would be rewarded. All of this would simply be the price system doing its work of keeping the economy on target, in the particular case of interest rates. What is behind the tradition of a floor of zero on interest rates? First, when inflation is high, interest rates never get down as far as zero anyway. So people get used to interest rates above zero. Second, even in the absence of inflation, when the economy is healthy, there are many investment projects that have the potential to earn a good return. Thus, when the economy is healthy, businesses vying for the funds to do their investment projects push interest rates above zero. Consumers who see the advantage of getting a car or a house or an education now rather than later also help push interest rates above zero when the economy is healthy. So the zero lower bound only becomes a problem when an economy conquers the bulk of inflation and then has a bad recession. The way that the traditional floor of zero for interest rates is enforced by government policy is by the government’s guarantee of what, leaving aside storage costs, amounts to an exactly zero interest rate on paper currency. As long as the government guarantees an interest rate of zero on paper currency, who would ever accept a significantly lower interest rate? As a technical matter, there is no difficulty in repealing the government’s current guarantee of a zero interest rate on paper currency and thereby freeing up all interest rates to go negative, if necessary. The key technical issue is to make it so there is no place to hide from the negative interest rates, not even by putting cash under the mattress; paper currency would earn more or less the same negative interest rate as money in bank accounts. See my first column on electronic money here and the presentation I have been giving at central banks around the world here. So it all comes down to interest rate politics. If, politically, the government doesn’t dare let interest rates go negative, they won’t be able to. But if the government quit gumming up the works of the price system by guaranteeing a minimum interest rate of zero, then negative rates would be quite possible, and even half-decent monetary policy using negative rates would be enough to prevent another Great Recession. The key political arguments for high interest rates when the economy needs low rates center on being fair to savers. Saving helps people to be self-sufficient in times of trouble, rather than having to beg others for help. And when the economy is healthy, additional saving makes it possible to finance more investment that builds up the productive capacity of the economy. So as a character trait, being a saver is rightly praised. But there is a time and place for everything, and the middle of a recession is the one time when we need people to spend rather than save in order to balance the economy. So while, in general, it is appropriate to reward savers handsomely for saving—as positive interest rates do in good times—it is also appropriate to charge savers for saving in bad times when we desperately need those who have a little financial leeway to spend. In bad times, there is no way to earn a positive return on business investment without taking some risk. So it is right and proper for those who insist on total safety in those times to pay for that safe storage, just as people are accustomed to paying to keep their belongings in physical storage units. What is more, the imperative of rewarding savers for the virtue of saving argues for returning the economy to robust health and positive interest rates as soon as possible. During serious recessions, negative interest rates are the key to quick economic recovery. The relatively ineffective alternative is zero or near-zero interest rates for years and years. Therefore, both on grounds of effectiveness and kindness to savers, negative interest rates for a few quarters are better than zero interest rates for years and years. ( c) to repeal the zero lower bound and allow negative interest rates for brief periods when economic recovery requires them. To me, the best choice is clear.